Reference No: 18208, case back stamped to the inside "18200"
Clasp/Buckle: 18K yellow gold Rolex concealed deployant clasp stamped "8385"
The Day-Date line (together with its less complicated sibling the Datejust) has historically been a canvas for Rolex to express its unbound creativity. As a result, the model features some of the most unusual dial configurations ever seen on a Rolex watch. The company went well beyond experimenting with different graphic styles, and the Day-Date can be found with dial options spacing from wood to lacquer, fossil, marble, coral etc. Offered in absolutely crisp and unspoiled condition, furthermore complete of its original warranty, the present example features the charismatic Onyx dial. 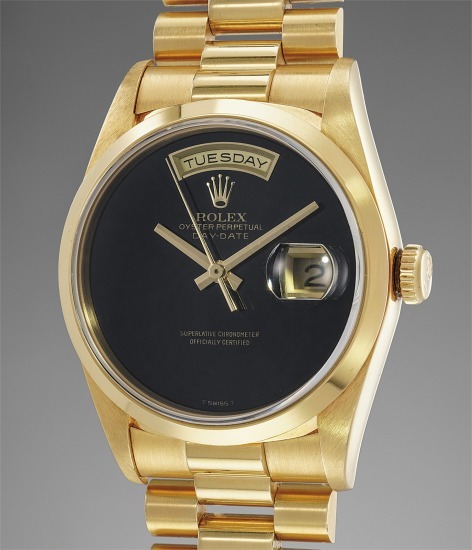 Defined by its midnight black hue and lacquer effect, the material is in perfect contrast with the warm gold case for a powerful aesthetic result, bolstered by the absence of virtually any graphic detail and by the presence of the gold rims to the day and date window, subtly recalling the gold case.